The top diplomats of South Korea and Japan will meet this week, Seoul's foreign ministry said Thursday, amid heightened tensions between the two sides over various issues. 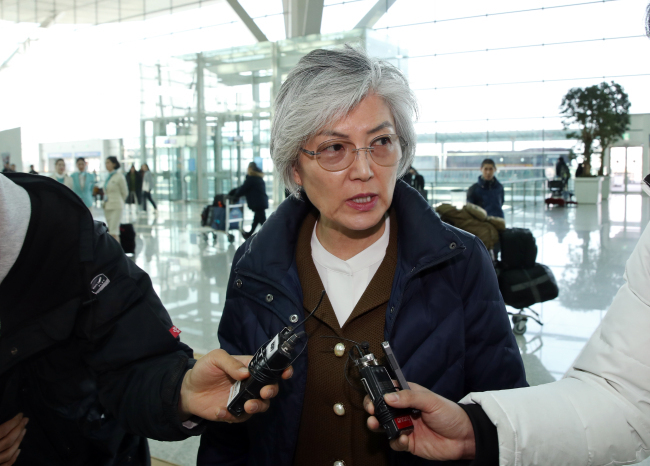 South Korean Foreign Minister Kang Kyung-wha will hold talks with her Japanese counterpart, Taro Kono, on the sidelines of the Munich Security Conference in Germany on Friday, the Ministry of Foreign Affairs said. Kang and Kono are expected to touch on various issues of mutual concern, from North Korea to bilateral ties. In particular, the two foreign ministers are expected to have a heated discussion on "follow-up" measures over a set of South Korean Supreme Court rulings last year against Japanese firms for forced labor during World War II. Japan has been demanding that the two sides initiate diplomatic talks over the issue based on Article III of a 1965 treaty between Seoul and Tokyo that normalized bilateral ties. The treaty stipulates that the two sides are to settle any dispute related to the treaty primarily through diplomatic channels. Tokyo has argued that the treaty settled all reparation-related issues related to its colonization of Korea. Kang and Kono are also expected to exchange views on the second United States-North Korea summit scheduled for Feb. 27-28 in Hanoi, Vietnam. The two foreign ministers last met on the sidelines of the World Economic Forum in the Swiss city of Davos on Jan. 23.